Do You Know these Common Sports Idioms? Sports idioms are so common in American speech that we often don’t think of the sport at all when using them. Businessmen say “just give me a ballpark figure” or “he already has two strikes against him” or “we need to touch base” without picturing a baseball game. All these expressions originated with sporting events—and knowing their background can help you understand their meaning. •	To ‘hit a home run’ means to have a major success. (In baseball, the team that is ‘up to bat’ tries to score ‘runs’ as their players hit the ball and run from first base to second, then third, and then ‘home’ base without being put ‘out’ by the other team. •	To ‘touch base’ is to contact someone, often about a particular project or offer. A runner in baseball must physically touch a base before the opposing player (guarding that base) catches or tags him with the ball. If the runner reaches the base too late (after the baseman has the ball), he is ‘out’ and cannot score. After three ‘outs’ the teams change places and the outfield team gets a chance to score. •	To ‘strike out’ is to fail at a project, especially near its beginning. In baseball a batter strikes out when he fails to hit (properly-thrown) balls three or more times. (This can include a weak hit that goes out of bounds.) He also strikes out if a player on the opposing team catches a ball he does hit before it touches the ground (a ‘fly ball’). •	We say someone has ‘two strikes against him’ when he starts out with disadvantages. If there are already two strikes against a team, a batter has much less chance of reaching home base and scoring a point. Unless he hits a home run, he will depend on the next player(s) to have a chance to reach home base. If any one of them is put ‘out,’ all the runners left on bases lose their positions and their chance to score. •	When someone ‘drops the ball,’ they lose an opportunity or sale they should have gotten—as when a baseman or outfielder catches a ball and then drops it, allowing the opposing team to get safely to base or even home. •	‘In the ballpark’ means within a certain range or approximate value. So does ‘a ballpark figure’—an estimate of approximate size or value. Both refer originally to balls hit within the ballpark (playing field) as compared to the less common situation in which the ball is hit completely out of the park. •	‘A whole new ballgame’ means a completely different situation. This expression can refer to a team catching up (no longer behind in score) rather than just starting a new game. •	‘Out in left field’ (or ‘way off base’) both mean something far from normal—often a very wrong, even wild, idea. •	A ‘rain check’ is now a note a store gives customers when a sale item runs out. It allows a customer to buy the item for the sale price after the sale is over. The term comes from baseball games in the 1800s that gave free tickets to another game if a paid-for game was cancelled due to rain. •	A ‘team player’ is more concerned about his team winning than about looking good or advancing himself. It’s used a lot in business a praise for people who work well with others. •	‘The ball is in your court’ means that it’s your responsibility to make a decision and act (and often also means that the speaker or others involved cannot act until you do.) This probably comes from tennis. Once the ball is on one side of the net the players on the other side must wait until it is hit back to them before they can play. •	‘Saved by the bell’ means a last minute reprieve from a bad situation. It comes from boxing. In a boxing match, if a boxer is knocked down and cannot get up again in a certain amount of time, he loses the match. If the bell marks the end of a round before the count ends, it saves him from losing. •	In a relay race, several runners from the same team take turns running. 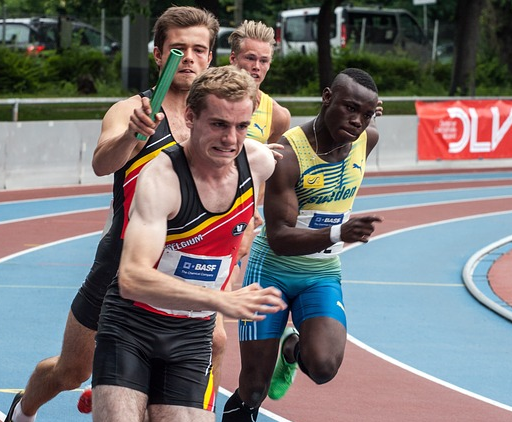 The current runner passes a small rod—the ‘baton’-- to the next runner without slowing down. It’s a difficult maneuver. So ‘passing the baton’ is when the current leader gives the main responsibility for a project to someone else. “Don’t drop the baton!” is encouragement to be ready to take responsibility and do your part so your team will have a chance to win. After the unexpected results of the November 2016 American elections, President Obama made a speech using a number of sports idioms and terms as metaphors for the election process. He talked about the arena (the place where a game is played), a baton hand-off, intramural (within a team—for example, a practice game), a relay (race), rooting for (cheering for or encouraging to win), scrimmage (an American football term for playing time), and team, which he mentioned seven times. Obama used the metaphor of a relay race as his core message—that we need to pull together as one team, because we win or lose together. He finished: “I’ve said before, I think of this job as being a relay runner. You take the baton, you run your best race and hopefully by the time you hand it off, you’re a little further ahead, you’ve made a little progress. P.S. If you’re interested in more information on relay races and passing or dropping the baton, see this explanation. You might also be interested in this video about the American relay team at the 2016 Rio Olympics.